A long time in the making! This LP is a special one. 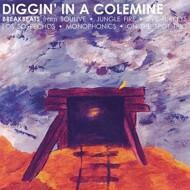 One- half funky instrumentals from the Tee See Connection, one- half breakbeats! Featuring some of the heavy hitters from the Colemine roster including Jungle Fire, Monophonics, The Jive Turkeys, and Los Sospechos! All new, original breakbeats recorded live to tape and ready to be chopped up!